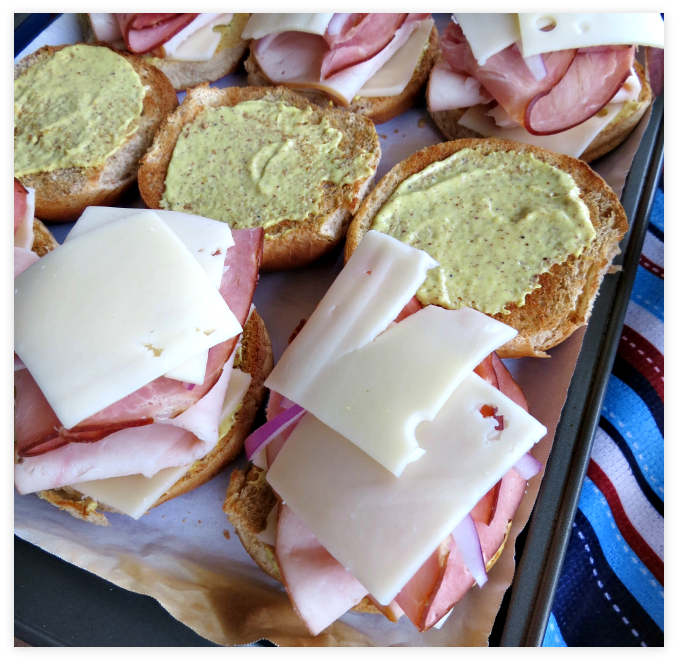 Smoky ham, melted Swiss cheese and spicy mustard on a soft, toasted bun. Serve up a platter of these Mini Cordon Bleu Turkey Sliders at your next football party and watch them disappear! 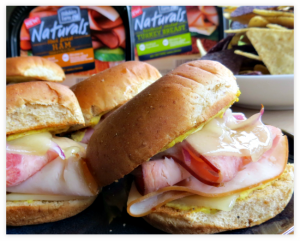 We eat sandwiches almost daily around here, so I knew I wanted to try Hillshire Farm Naturals™ lunchmeat as soon as I saw it on the shelves. Feeding my family nutritious, healthy meals is very important to me, so I try not to buy lunchmeat with artificial ingredients or nitrates. The problem with that was there weren’t many choices available – until now. 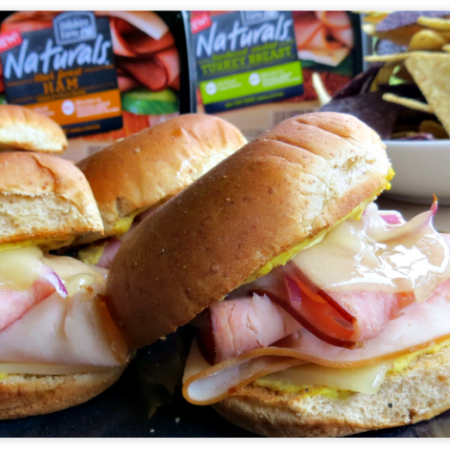 Hillshire Farm Naturals™ come in four flavors: Slow Roasted Turkey Breast, Hardwood Smoked Turkey Breast, Honey Roasted Ham, and Black Forest Ham. It’s free of artificial ingredients, preservatives, colors and is incredibly low in fat and calories. But none of that matters if it doesn’t taste good, right? Well, not only is 100% good for you, but it’s 100% delicious! 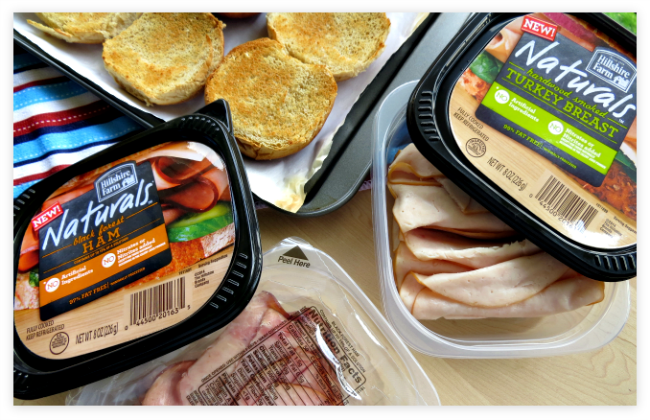 This is premium quality, perfectly cooked and seasoned lunchmeat. 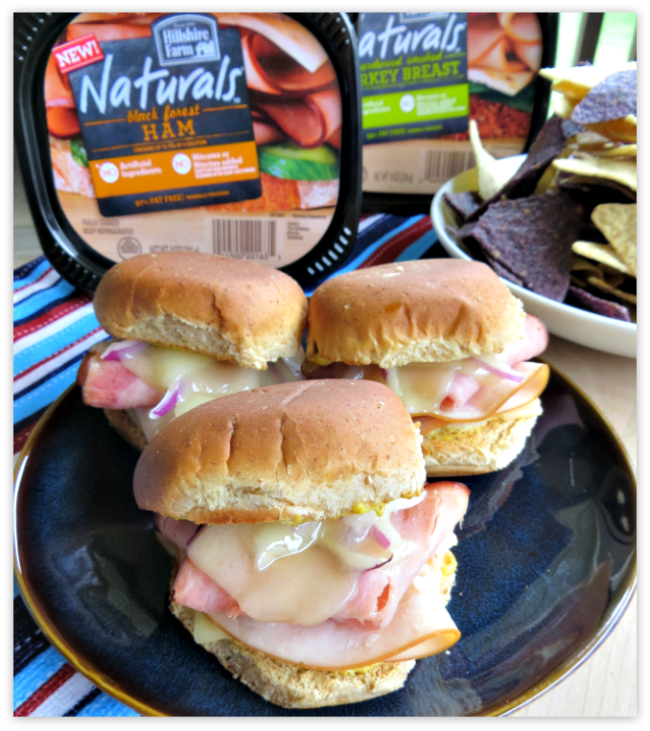 When I told a good friend of mine that I was asked to create a recipe using it, her exact words were “that is the only brand of lunchmeat I’ll eat” – it’s that good! The first thing I noticed was the packaging. It’s double-sealed for freshness and comes in resealable tubs, which I love! I use them almost every day when packing my husband’s lunch. They’re the perfect size for sandwiches! Next I noticed that it wasn’t slimy at all, which is a huge deal in my house. 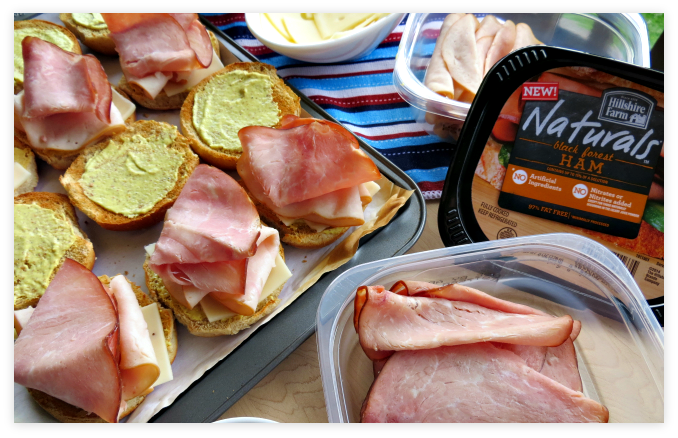 When my kids were growing up, they actually refused to eat lunchmeat that was slimy, so I usually made my own sandwich spreads or sliced meat myself. This is real meat ya’ll, and it holds up to just about any kind of preparation – not just sandwiches. I’ve used it for breakfast burritos, appetizers, and all kind of sandwiches both hot and cold. For this recipe, I decided to go with sliders because they’re easy to eat and perfect for any kind of party or event. 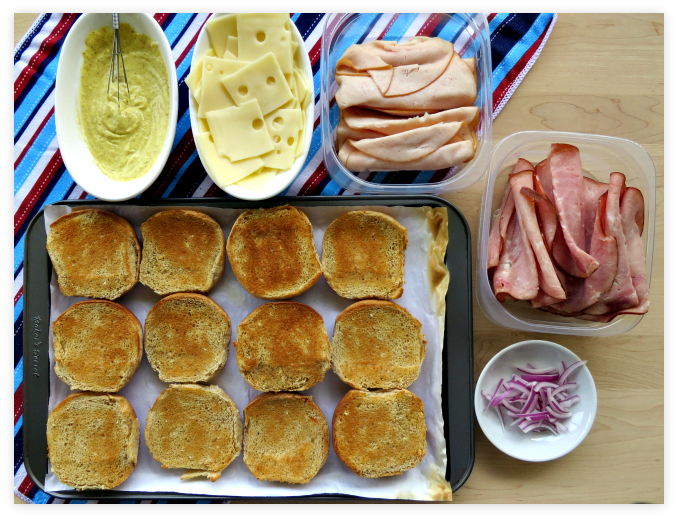 Since my everyone in my family loves Cordon Bleu, I decided to make my own version – slider style! 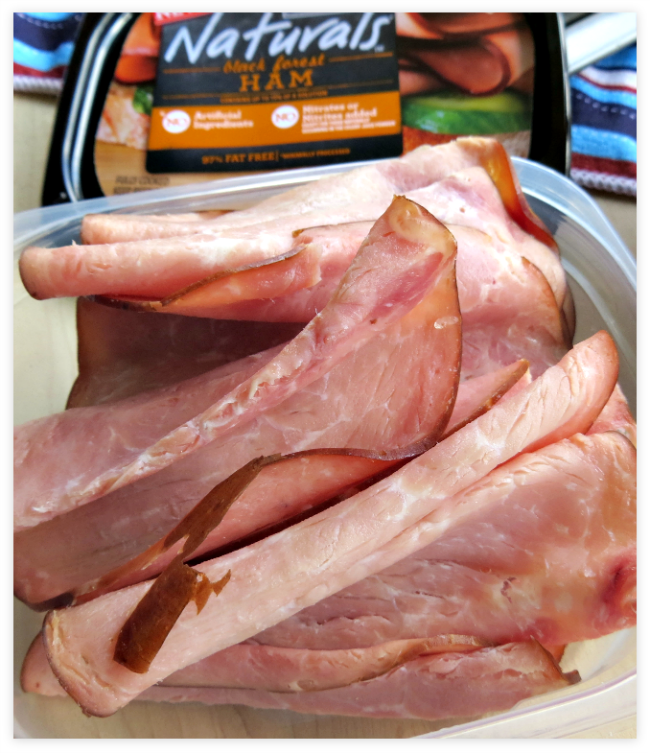 The traditional recipe uses chicken, but I went with the Hillshire Farm Naturals™ Hardwood Smoked Turkey Breast and Black Forest Ham. Ham is a must in any Cordon Bleu and the smoky flavor of the turkey was a delicious twist on a classic recipe! I like to set up an assembly line when I make sliders, and I do everything right on the pan I’m going to bake them on! Preheat your oven to broil. 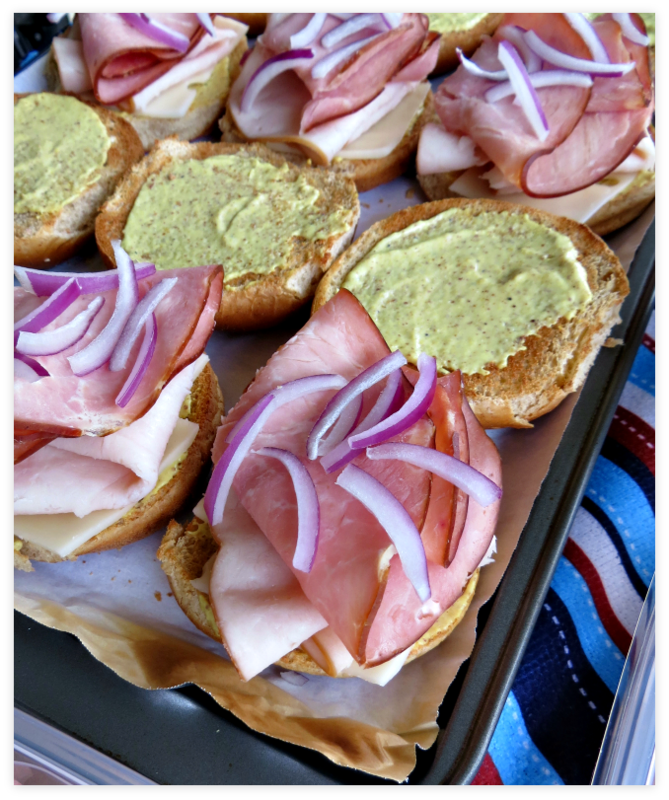 Split six slider buns in half and place them open-faced on a baking sheet lined with parchment paper or non-stick foil. Broil until they are lightly brown, which happens very fast, so watch them close! After toasting your buns, they’ll need a good slathering of my spicy mustard sauce on each piece (recipe below). Next, add a half of a slice of Swiss cheese to each bottom piece (I break each slice into fourths). Top the cheese with one piece of ham one piece of turkey. And then two more squares of cheese. Remove the top piece of the bun from the pan and broil the sliders until the cheese is melted, which was about 40 seconds in my oven. Add the top of the buns and serve immediately! I bought my Naturals™ lunchmeat at Harris Teeter, but you can find the location closest to you using their handy dandy product locator. And if you’re not 100% satisfied with it, Hillshire Farms provides a satisfaction guarantee and will refund your money 100%. Two thumbs up for awesome customer service! Split six slider buns in half and place them open-faced on a baking sheet lined with non-stick, oven-safe foil or paper. Toast until they are lightly brown, which happens very fast - so watch them close! Mix the spicy mustard, sour cream, and mayonnaise with a pinch of salt and pepper. 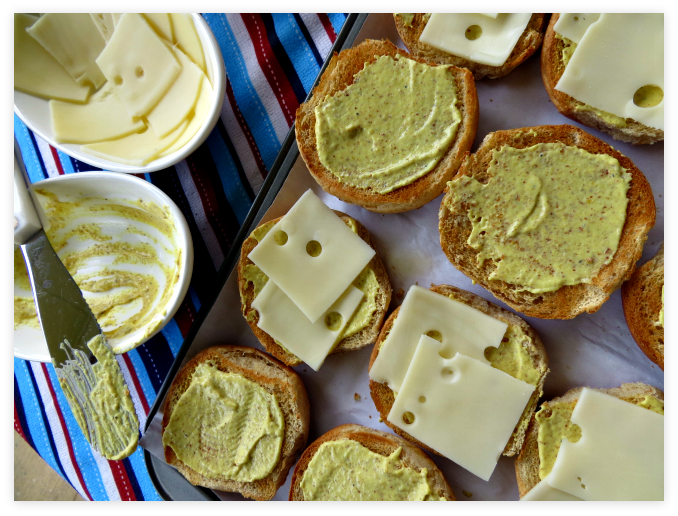 Spread each half of the toasted buns with mustard sauce. Top the bottom half of the buns with 2 squares of cheese followed by (1) slice each turkey and ham. Them add some onions and top with two more squares of cheese. Remove the top piece of the bun from the pan and broil the sliders until the cheese is melted - about 40 seconds. Add the top of the buns and serve immediately!